[OCT. 31, 2001] It was Oct. 30. A full moon, partially masked by an eerie cloud, loomed over Charleston — and Lady Railer volleyball players, coaches and fans got the scare of the their postseason life. It had nothing to do with Halloween. It had everything to do with the Lady Railers being down 4-10 in Game 2 of their sectional semifinal match against Effingham. And here comes the scary part — the Lady Railers had already lost Game 1 by a score of 12-15. Fortunately, a great all-around team effort and extraordinary performances by Christina Xamis and Kelli Gleason ended the nightmare. Everyone’s heart is beating again. The Railers are still alive. The heart-stopping final score was 12-15, 15-11, 15-7. The Lady Railers advance to the sectional championship match on Thursday at 7 p.m. in Charleston. They will face Champaign Centennial, who upset No. 2-seeded Decatur Eisenhower in the second three-game match of the evening. The fifth-seeded Effingham Flaming Hearts arrived in Charleston pumped up, ready to play and eager to send the No. 1-seeded Railers home until next year. They almost got their wish. In Game 1, Effingham could do no wrong. Everything seemed to go their way. Not that the Railers didn’t put in the effort; they did. But every ball and every official’s call went against them. The Railers took what they could get. What they got was a beginning glimpse of what would eventually help win the match for them: the serve of Christina Xamis, the net play of Kelli Gleason and a never-say-die effort from everybody. In Game 1 that effort totaled two service points, both aces for Christina, and the net-finesse plays of Kelli Gleason. Before the match was over, Christina would have a phenomenal, "you were in a zone" 17 total service points — eight aces, six digs and an assist. "X-traordinary!" Kelli would end up with eight service points, seven kills and 27 assists, among other statistics. Phenomenal, considering Kelli is usually the one who sets up the kill for everyone else except herself. All of this while the Railers were facing defeat and imminent elimination from the postseason. But back to Game 1. The Flaming Hearts won it 15-12. Forget the rest of the details. They would scare you. In Game 2, the Railers, in spite of all their effort, soon found themselves down 4-10, after initially being up 4-3. Effingham ran off seven consecutive points before a defensive block by Michelle McFadden resulted in a side-out for the Railers. Kelli Gleason’s next three serves began the Railer comeback. The momentum was shifting slightly back to the Railers, but it was still 7-10 in favor of Effingham. Then came Christina Xamis’ first service run — six straight service points, including three aces. A kill by Kari McFadden and two blocks by the Railer front line and the Railers were up 13-10. Momentum shift accomplished. Serves by Missy Aper and Kari McFadden notched points 14 and 15 and the Railers were "back to even"; match score, one game each. In the decisive Game 3, the Railers never trailed. But that doesn’t mean it wasn’t a battle to the very end. At the service line, Christina Xamis, once again, made sure of it. 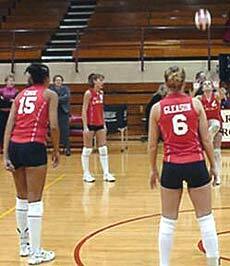 Eight service points and three more aces were more than Effingham could handle. The "service specialist" had worked her back-line magic. Kelli, Tina Cook, Kari McFadden and Darcy White reclaimed ownership of the net. Everyone hustled, passed and dug out difficult hits. Just as the Railers refused to lose Game 2, they willed themselves to win Game 3. Missy Aper’s serve and a well-placed dink by Kari McFadden produced the game and match final score of 15-7 in favor of the Railers. EVERYONE played like champions. Tireless defense was played. 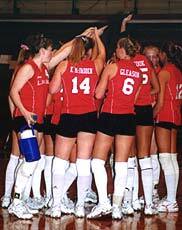 For example: Missy Aper and Christina Xamis, six digs each; Kari McFadden, five digs and two blocks; Samantha Conrady, four digs and two blocks, Tina Cook, three blocks and Michelle McFadden, two blocks. Likewise, offense was spread around the court: Kari McFadden, 10 kills; Tina Cook, nine kills; Kelli Gleason, seven kills; Darcy White, five kills, Michelle McFadden, three kills; and Samantha Conrady, two kills. Everyone played with intensity and passion. Excellent coaching resulted in the appropriate adjustments being made to avoid a repeat of Game 1. Without any of these parts, the Railer’s season would now be over. The Railers learned some scary lessons last night. Every team is gunning for you. Bring your A game each night. Emotions will run high. Refuse to lose. Whatever it takes! And, the next time you want to scare me … do it any place except on the volleyball court. for the Prairie Central championship, 7 p.m.
for the Charleston Sectional championship, 7 p.m.
[OCT. 29, 2001] Never take any team for granted. Take each match one at a time. Two postseason truths. Saturday night the Lady Railers heeded these truths and dominated the Rantoul Lady Eagles 15-4, 15-3 to claim the regional title. The Railers were so dominant that the match took only 30 minutes to finish. The Lady Railers (27-7-1) move on to play Effingham in the Charleston Sectional on Tuesday at 6:30 p.m. Behind the excellent serving of Kelli Gleason, Christina Xamis and Samantha Conrady, and great blocking by the entire front line, the Railers rolled to victory in Game 1. In fact, the only time the Railers trailed was at 0-1. Every point Rantoul scored in Game 1 came when an over-pumped-up Railer hit the ball long on an over-zealous kill. Not a bad problem to have. At 0-1, Kelli Gleason stepped to the service line. A powerful kill by Tina Cook, two aces by Kelli, and two suffocating blocks by Tina Cook and Michelle McFadden, and the Lady Railers led 6-1. Rantoul’s next three scores came when Lady Railers missed on front-line kills. After an ace serve by Darcy White put the Railers up 7-4, Christina Xamis came in and worked her magic at the service line. Once Christina put the ball in play, three faulty hits by Rantoul and a kill by Tina Cook put the Railers ahead 11-4. Missy Aper and Samantha Conrady finished off the Eagles as great Railer hustle and excellent net blocking brought home the victory. If the Railers appeared to dominate in Game 1, they were even more dominant in Game 2. Having worked off some of the overkill adrenaline, the Railers settled down, some smiles appeared on their faces between plays, and they took care of business. Once again, it was the serving of Samantha Conrady, Christina Xamis and Kelli Gleason that secured the regional championship. These three accounted for 13 of the Railer points. Kari McFadden and Darcy White had the remaining two service points. The Railers methodically eliminated Rantoul by once again playing well together and with good hustle and energy. Front-line blocking was again crucial to the victory. The game and the match ended on a seven-point service run by the quiet but powerful Samantha Conrady. With Samantha at the service line, a dink and a kill by Darcy White as well as a game-ending kill by Kari McFadden brought the evening to a close. Overall it was a good first postseason match for the Railers. Their serves and blocking skills seemed even more impressive than usual. Excellent, well-placed serves by Samantha Conrady, Kelli Gleason and Christina Xamis were crucial to the championship. Samantha ended with 10 service points, including two aces, while Kelli and Christina ended with nine and seven points, respectively, including three aces. An additional ace by Darcy White brought the team total for the night to six. The entire team hustled through several extended rallies with a "never let it drop on our side" attitude. Defensive blocking by Michelle McFadden, Tina Cook and Kari McFadden ended several Rantoul scoring attempts. All of these game attributes will be crucial as the Railers move on through the postseason. Congratulations on being regional champions! You earned it all year long, match by match. You also earned your No. 1 seed. Now you’ll have to defend it each night. Beginning today, you face two more contrasting tournament truths — The competition gets better in each successive match; there is no tomorrow. Mount Pulaski defeated Blue Ridge 15-2, 15-7. Hartsburg-Emden defeated Olympia 6-15, 15-6, 15-7. This was H-E coach Jennifer Hayes’ 200th career victory! 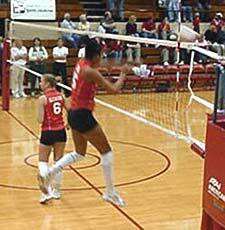 Mount Pulaski vs. University High, 6:30 p.m.
Central Catholic vs. Hartsburg-Emden, 7:30 p.m.
[OCT. 25, 2001] Rantoul defeated Charleston last night in the Lincoln Regional semifinal volleyball action by the match score of 11-15, 15-10 and 15-6. Lincoln will face Rantoul at 7 p.m. this Saturday for the regional championship. The winner will also earn the right to play next Tuesday in the Charleston Sectional. Rantoul will be looking for revenge on Saturday. 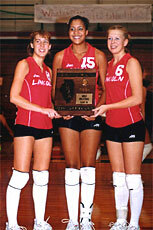 Lincoln previously defeated Rantoul in a regular season, non-conference match in late September. In last night’s match, Rantoul’s Kindi Schlittler had nine kills and Rachel Idues had nine service points to help their team to victory. Also for the winners, Katie Schmidt had six blocks. Rantoul’s record stands at 15-17. For the losing Charleston Lady Trojans, who end their season at 14-19, Audra Roach had 13 kills and Amanda Cutright had six kills. Denise Wright added eight points and 15 assists, and Ashley Duzan contributed four blocks. The doors will open at LCHS and ticket sales will begin at 6 p.m. this Saturday. All tickets are $3, with the price being set by the IHSA. 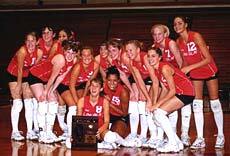 [OCT. 25, 2001] The Lincoln College volleyball season came to an end Wednesday night as the sixth-ranked Lady Lynx lost to third-ranked Shawnee in three games. The Lynx lost 30-24, 30-26, 30-22. Beth Guy, a Hartem graduate, continued her fine play with 22 set assists, nine points and five aces, while Janine Buettner added eight points, two aces and five kills. Molly Owens contributed six kills and two blocks, while Amy Cox had four points, six kills and two blocks. Coach Mark Tippett said: "I felt we grew a lot as a team this season. I was pleased with the way they responded during my first season as coach. We were competitive and in nearly all of our matches. I am looking forward to next year, as we have eight returning. If we can get a few good recruits, we should be able to show a lot of improvement." Lincoln College completed its season with a 14-17 record. • I say, tip the hat to Railer football coach John Oaks. While they haven’t had the success that everyone would like to see, good programs are not produced overnight. How long did it take the LCHS volleyball team to become an annual power? And do you realize that the Railer hoops squad has been a dominant team for several decades? Take away a few breakdowns and a few bad bounces, and you’re not only looking at a couple of wins but you’re looking at a competitive team. Here’s hoping that coach Oaks and his staff will stay around a few years and build the program to a competitive level. If Taylorville can do it, so can Lincoln! • If you missed the fifth volleyball scuffle between LC and LCC Tuesday night, you missed a fan’s smorgasbord. The match went the full five games and looked like it was headed for several additional minutes of play. While I’m sure coach Crawford was not exactly thrilled with the performance of his team, some credit must go to coach Tippett and the Lady Lynx. They seemed to out-hustle the Angels all night and seemed to want the game a little more. It could be passed off by saying that LCC was looking ahead to this weekend’s regional matches in Chicago. Whatever the case, the LDN is going on record now as saying that both of these clubs have the potential to be very dangerous during the playoffs. Look for both to pull off their share of surprises.